I feel sorry for all the sarcastic people out there who don’t understand the beauty of bumbags. They’re a stylish game changer in my opinion, being both practical and also – for those who know about trends (not me, as it happens, but I absorb a certain amount in the line of duty) high fashion. Any sarcasm (from children, friends or colleagues) is incredibly misguided. Catwalks as Stella McCartney, Kenzo and Gucci were positively heaving with bumbags last year, and now they have filtered down to the high street. I now own two. The first is from Primark. 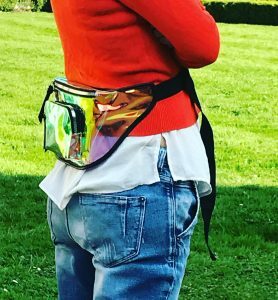 It’s a sort of semi-transparent rainbow plastic item, which is large enough to contain a Kindle, a can of ginger beer, my credit card and a pair of sunglasses, which is sufficient for any bike ride with kids. It only cost £6, t(hey have an extensive range available). My sons were in hysterics when they saw it, as they refuse to wear anything but pure polyester with branding on it, what do they know? 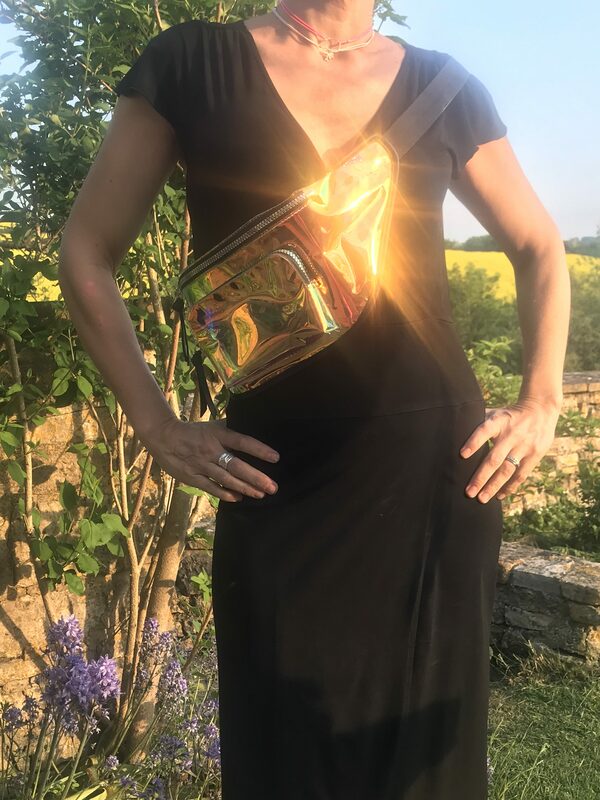 The second is a neon pouch which I use for running, and holds a phone, my car keys, a friend’s car keys (this is important – bumbags make you a better person) and a lipgloss. (I only remembered I owned it a couple of weeks ago. I’m so fashion forward I already had one!). 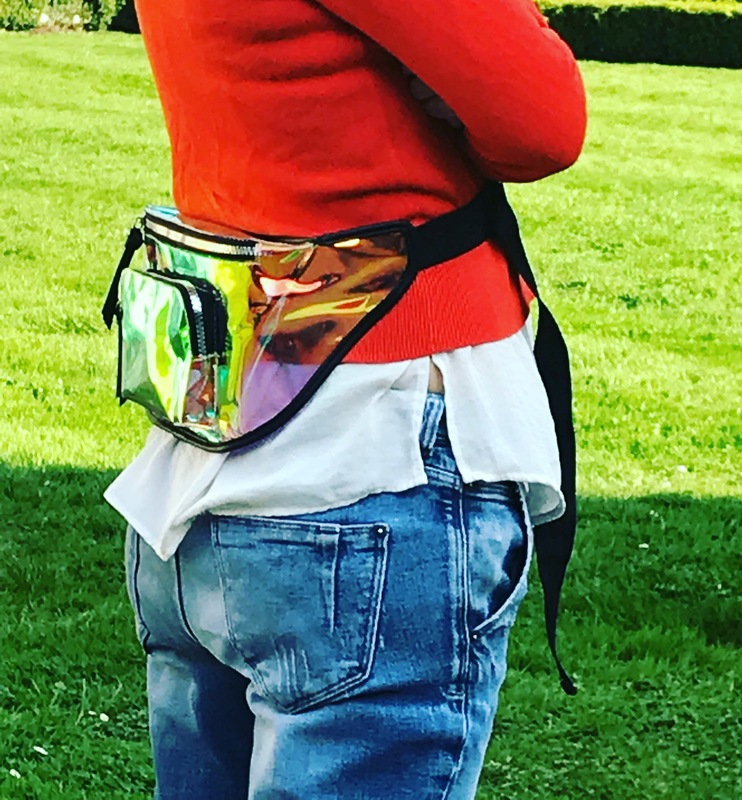 A bumbag can be worn in the traditional way – around the waist and hanging over your bottom, which is obviously the most practical if you’re running or cycling. Or – 2018 update! – try them slung over the shoulder and across the body. Of course this means that they aren’t really – by definition – bumbags, as they’re nowhere near the relevant body part. But so what. Invest and be cool at barely any cost.